The Disabled Students’ Program, or DSP, at UC Berkeley was one of the first disability services programs in higher education in the United States. It was founded by students with disabilities in 1970 after they organized to advocate for access and inclusion at UC Berkeley. The original student activists called themselves the “Rolling Quads.” Their activism helped spur a movement that extended into the city of Berkeley and across the United States and eventually led to the passage of the first comprehensive civil rights law for people with disabilities — the Americans with Disabilities Act, or ADA, in 1990. Today DSP is part of the Division of Equity and Inclusion, and we serve more than 2,600 undergraduate students with a broad range of disabilities, including apparent and non-apparent disabilities such as mental health disabilities or chronic health conditions. We have grown dramatically throughout our The program serves about 9 percent of the UC Berkeley student population. We believe in a continuous improvement approach to making our program more service-oriented and welcoming to the students we serve. DSP services are essential to Berkeley students with disabilities. Unlike the accommodations process in high school, the accommodations process in postsecondary education has to be negotiated between the students and the faculty administering those accommodations. This can be a taxing process for students, and we try to support them through the accommodations process as much as possible. Last year, DSP staff proctored 8,072 exams, produced more than 6,000 documents in alternative media, provided more than 5,000 hours of live captioning and provided 1,772 note takers to DSP students. In addition, the program offers career services, specialized support and coaching for students on the autism spectrum and a specialist who is dedicated to working with graduate students. But compliance with the law is insufficient in creating an inclusive campus for students with disabilities. We need to think about the purpose of our program, our role on campus, the needs of our students with disabilities and a vision for access and inclusion of people with disabilities at UC Berkeley. It is crucial that we have conversations with students, faculty, staff and others about what our goals for access and inclusion should be and how DSP can take steps toward reaching them. We constantly need to rethink and revise our policies to be as inclusive as possible. Last year, our staff wrote a new mission statement to reflect these goals: “The Disabled Students’ Program promotes an inclusive environment for students with disabilities.” DSP, in partnership with our new ADA/504 coordinator, Ella Callow, and our students, will participate in a long-term planning process to determine what the campus needs to do to move further forward with this commitment to a fully inclusive, welcoming and accessible university environment. It is necessary that we meet the needs of our growing student population. We are continuously exploring innovative and creative ways to serve our students. In the near future, we will hire a learning specialist for TRiO along with some student academic coaches to provide academic support to students who come from underrepresented groups or disadvantaged financial backgrounds. 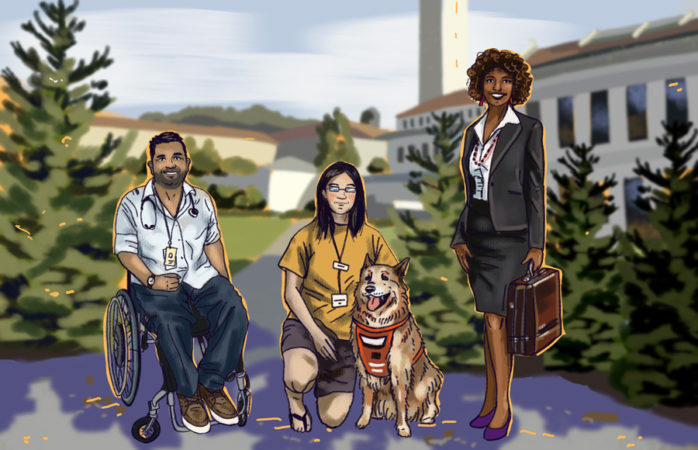 As a public university, UC Berkeley has a legal obligation to provide accommodations and adjustments to students with disabilities in order to give them full access to all university environments. But our campus leadership must commit to moving beyond compliance and strive for a fully inclusive, welcoming and accessible university environment for all people with disabilities. We must find creative solutions that benefit our entire campus. Our students with disabilities are an integral part of the rich diversity that makes UC Berkeley an outstanding public university, and DSP is committed to doing everything we can to maximize their potential and contributions. UC Berkeley students with disabilities helped spur a movement that began to change our society for the better, and there’s still a lot of work to do both in the greater community and at UC Berkeley to move toward the ideals of full access and inclusion. We look forward to continuing that work along with our students in the years ahead. Karen Nielson is the Executive Director of the Disabled Students’ Program. Martha Velasquez is Associate Director of the Disabled Students’ Program.